Seadramon-species that survived the harsh environment of the Folder Continent area evolved into this form, in order to outlive others in the Digital World where the weak are food for the strong. Its body became a size larger, the carapace covering its head got harder, and a lightning-shaped blade has grown on its calvaria. Its intelligence has developed more than the Seadramon-species, so it chases its opponent persistently, like a seeking torpedo, and reliably brings them down. Its Special Move is a powerful lightning strike fired from the blade on its calvaria (Thunder Javelin). There is a generator device equipped in the carapace on its head, in order to enable this Special Move. — Digimon Adventure: "Break through the Barrier! Zudomon Spark!" — Digimon Adventure 02: "Submarimon's Escape from The Bottom of the Sea"
A form that was a Seadramon-species that lived long in the harsh environment surrounding Folder Continent, but evolved in order to survive in the Digital World where the weak are food for the strong. | Dra is short for dragon. Anime/Manga Digimon Adventure: "Break through the Barrier! Zudomon Spark!" サンダージャベリン Sandā Jyaberin Lightning Javelin/Thunder Javelin Fires electricity from its horn. Stabs the opponent with the blade on its head. アイスリフレクト Aisu Rifurekuto Ice Reflector Hits the water surface, creating a wall of ice. 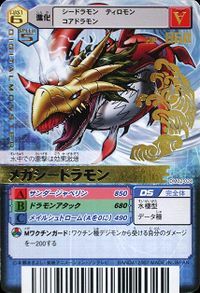 メイルシュトローム Meirushutorōumu Mega Ice Blast/Mail Storm Shoots a freezing cold blast from its mouth, summons a great wave, or summons an electrically charged tornado. Stabs the enemy with the electrified blade on the head. Constricts the enemy with its coils. Mega Seadramon from Digimon Adventure. 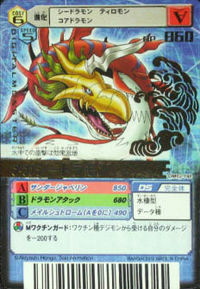 A Mega Seadramon was a servent of Vamdemon. When Jou, Takeru and Patamon tried to enter Odaiba through Vamdemon's fog barrier they were attacked by Mega Seadramon. Jou's Gomamon evolved to Ikkakumon but Mega Seadramon attacked them and defeated Ikkakumon. Takeru was in danger of drowning as he fell off Ikkakumon's back. Jou saved him and soon his Crest of Sincerity glowed allowing Gomamon to evolve to Zudomon. 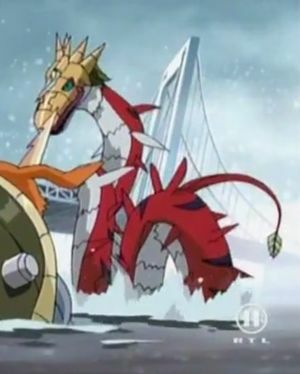 In his Perfect form it was finally able to kill Mega Seadramon allowing them to enter Odaiba. In "Submarimon's Escape from the Bottom of the Sea", Mega Seadramon is controlled by an Evil Spiral. It attacks and traps the Chosen Children inside of an underwater oil platform and waits for their oxygen to run out. They sneak Iori out in a one-man escape pod. 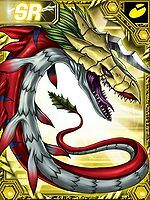 He returns with Jou, his Ikkakumon and a Whamon. Ikkakumon fights with Mega Seadramon but Mega Seadramon has the upper hand. However when Iori accesses the Digimental of Sincerity that had been hidden in the platform he armor evolves his Armadimon to Submarimon. Working together Ikkakumon, Submarimon destroys the Evil Spiral freeing Mega Seadramon. 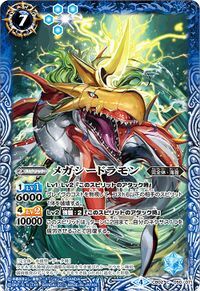 In "Assault on Black War Greymon" the same Mega Seadramon helps the Chosen Children by recruiting several Rukamon and helping them defend a Holy Stone from Black War Greymon in the ocean. Despite their effort the stone is still destroyed. Mega Seadramon appears as an obtainable Perfect-level Data type Digimon in Digimon World. 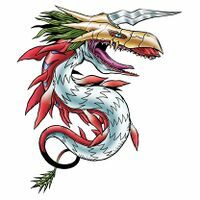 Mega Seadramon, along with Herakle Kabuterimon and Hououmon, are the only obtainable Perfect Digimon that are never seen as NPCs in the game, so the only way to witness a Mega Seadramon in the game is to evolve your Digimon into one. Mega Seadramon has also a boss variant in the game, being Waru Seadramon, which serves as a member of Orgemon's gang. Bonus Conditions: Don't battle at all and have at least more than 40 techniques mastered. Mega Seadramon's Digivolution item is the Coral Charm which lets any Adult Digimon evolve into Mega Seadramon. 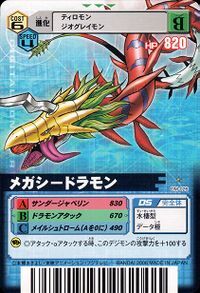 Mega Seadramon is an obtainable Digimon. Evolves from Coelamon (0+ DP) or Seadramon (0+ DP) and can evolve to Metal Seadramon (0+ DP). 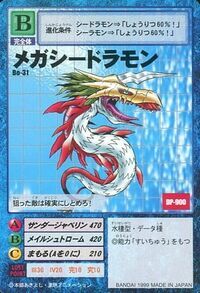 Mega Seadramon is an obtainable Digimon which is evolved from Airdramon, Growmon, Kabuterimon, or Seadramon, and can evolve to Marin Angemon. It can also be obtained as a collectible card. 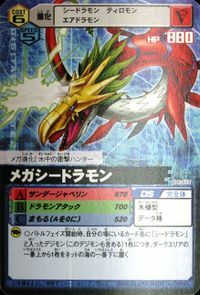 Its card is part of the Mega Digimons (メガデジモンズ Mega Dejimonzu) set. Evolves from Seadramon or Coelamon. 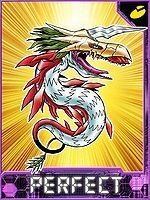 Can Jogress with a compatible Digimon to get Metal Seadramon. Evolves from Seadramon or Ebidramon. Can Jogress with a compatible Digimon to get Plesiomon. 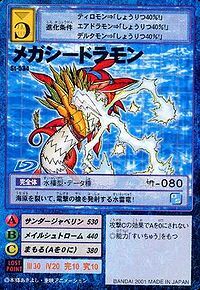 Mega Seadramon can evolve from Gaogamon, Gawappamon, Geo Greymon, Karatuki Numemon, Peckmon, or Reppamon. Can evolve to Jumbo Gamemon, Mirage Gaogamon, Ravmon, Shine Greymon, or Sleipmon. 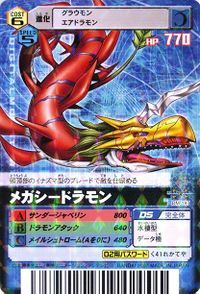 Can also Burst Evolve into Leviamon or Boltmon. 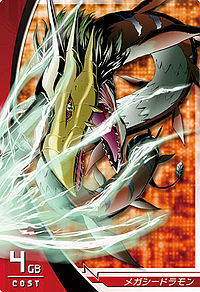 Mega Seadramon is an unobtainable Leader Digimon. It uses the electric generator in the horn on its head to discharge its attack! 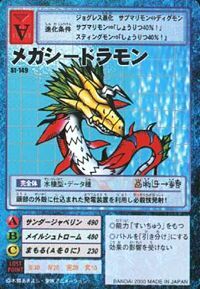 This aquatic, electric dragon fires a lightning spear that slices the sea apart! It will bring down its target without fail! Mega Evolution! This underwater hunter uses lightning to attack. It finishes enemies off with the lightning-shaped blade on its calvaria. 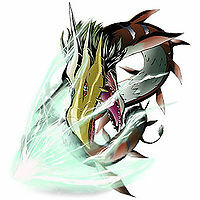 Its electric attacks greatly increase in effectiveness when used underwater. Its head has grown not only to become covered by a sharp carapace, but also a lightning-shaped blade, as well as high intelligence. It has adopted a cautious personality, and once it identifies an enemy, it will chase and bring down that enemy without fail. Seadramon-species that survived the harsh environment of the Folder Continent area evolved into this form, in order to outlive others in the Digital World where the weak are food for the strong. This page was last modified on 24 April 2019, at 21:54.